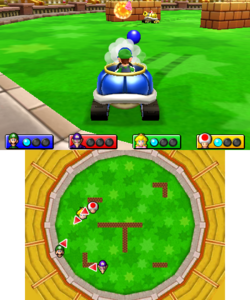 Tanks a Lot (Koopa Koliseum in PAL versions) is a General minigame from Mario Party: Island Tour. The name is a pun on the saying "thanks a lot". This minigame is similar to Shell Shocked from Mario Party 2. The field where the players are battling is seen overhead. The camera moves to the player, and the minigame begins. The players are in tanks, and are blasting at each other. If a player get blasted, the player that they hit respawns, and they get a point. The player that gets three points first wins. Rules – NTSC "Destroy your opponents' tanks before they can destroy yours." Rules – PAL "Destroy your opponents' tanks before they can destroy yours. Score three hits to win." This page was last edited on January 21, 2018, at 12:44.